At the Back to School Breakfast for all faculty and staff, Dr. Jeanette Turner announced the Teachers of the Year for the 2014-2015 school year. 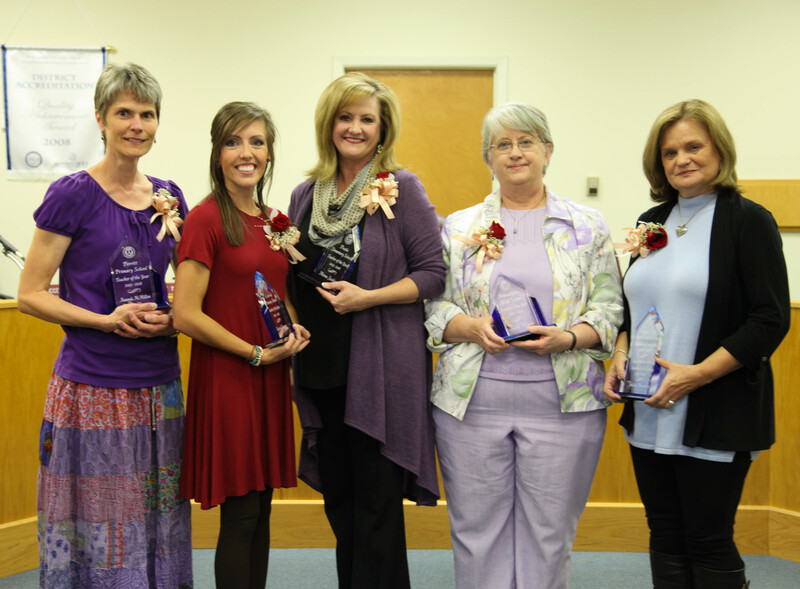 Shirley Howard, Kay Hyde, Laurel Cannon, Mona Jackson and Amanda McMillion were the five teachers chosen to represent each Arkadelphia school campus. Howard was also selected as the District Teacher of the Year. A reception for the five honorees was held on Tuesday, Oct. 20, in the Central Primary School cafeteria. Each teacher was introduced among friends, family and other faculty. After the reception, Superintendent Donnie Whitten and President of the Board of Education Jeff Root presented each teacher with an award at the October Board of Education meeting. Along with District Teacher of the Year, Howard is the Teacher of the Year for Goza Middle School. She earned her bachelor’s degree from Arkansas State University and a master’s degree from Harding University. Howard has been teaching art at Goza since 2008. Prior to Goza, she taught art in the Grubbs, Cross County and Newport public school districts and at Pulaski Academy in Little Rock. Howard makes it her mission to engage students in a variety of exciting art lessons and experiences. She is highly respected by her peers and is a true representation of professionalism and educating the whole child. Hyde was selected to represent Arkadelphia High School as Teacher of the Year. She is a graduate of Ouachita Baptist University and has taught math at AHS for four years. Her career spans 32 years and includes teaching in Sparkman, Mineral Springs, Murfreesboro, Malvern and Stuttgart. Hyde has a thorough knowledge of mathematics and excellent rapport with her students. She is often seen tutoring students before and after school. Hyde is a proud supporter of the Badgers and has been known to cheer them on until she gets hoarse. As a former student stated, "An amazing teacher like this one is hard to find, difficult to part with, and impossible to forget." Cannon is the Teacher of the Year for Central Primary, where she has taught second grade for five years. Cannon earned her bachelor’s degree in Early Childhood Education from Henderson State University. She recently earned a master’s degree in School Counseling from HSU as well. Cannon has a way of working with children that leaves them feeling appreciated and smart. She handles classroom discipline with dignity and never humiliates a child. Cannon builds partnerships with parents and makes them feel welcome in her room. She is a true leader among her peers and is always willing to lend her ideas and talents to support others' projects. Jackson joined the faculty of Peake Elementary School as a fourth grade teacher in 2013. She earned a bachelor’s degree in Speech Pathology from OBU. She later attended Texas Women's University and completed requirements for certification in Elementary Education. Prior to joining our district, Jackson taught in elementary schools in Sparkman, Little Rock and Texas. Jackson holds National Teacher Board Certification and is committed to growing as a professional. She helps identify and plan interventions for struggling students and helps organize events to involve parents in the school. The rapport she has with students and parents alike is admirable. McMillion was selected as the Teacher of the Year at Perritt Primary School, where she has taught since 2004. She currently teaches first grade, but she has also taught Pre-K and fourth grade within the district. She began her career teaching fifth and sixth grade math in the Cedarville School District. McMillion earned a bachelor’s degree in Elementary Education from Hendrix College and a master’s degree in Special Education from the University of Arkansas at Fayetteville. She is a dedicated professional who accepts full responsibility for ensuring that each student in her classroom succeeds. She is a master at differentiation and promotes STEM education with her students.